Three of us went to explore the demonstration, Permaculture Land Site run by Manda Brookman near St. Ives this year. We are rather belated in relaying the experience, but I guess late is better than never. The site is on high ground half way between St. Ives and Penzance, so really well situated for exploring that part of Cornwall. We (Liz, Annie and Heather) spent time with both Manda and her mother and father in law (Alan), who left London inspired by ‘The Good Life’. Alan bought the land in the 1970’s (about 30acres?) as grazing fields which he let re-wild. He started planting many trees and plants – most of which are productive of fruits. There is a National Trust hill opposite the site which we clambered up. It was amazing that you could barely see the two houses hidden in the mostly native woodland below. Alan and his wife very generously spent time with us on Sat. morning, plying us with coffee and biscuits, whilst regaling us with how they developed the area and the difficulties encountered along the way. Both of Manda’s parents are truly charming people who live completely off grid, as does Manda and her 2 children. Both of the houses that they live in were self-built, and surrounded by what is now woodland. Manda’s Father-In-Law had had to cut down bracken etc. for us pitch our tents. This was true ‘wild camping’ with water fetched from the stream and filtered through a British Berkefeld gravity filter. We met her 2 working pigs who are constantly rotated around the area to clear the next piece of ground needing to be worked on. Manda also encourages ‘Woofers’ who either camp or stay in a little cabin in return for work on the land. They have a regular stall at the local country market where they sell fruit and vegetables produced for the income they need to buy the extra little things that they cannot produce for themselves, and hence be self-sufficient. The work on this site is truly inspirational. For anyone who is interested, Manda is happy for you to come to stay on a Woofer style arrangement, or for donation to the site (which is what we did). We can thoroughly recommend the visit. Manda had kindly organised for us to visit Raymond Yarwood’s food forest nearby in Hayle – Towans Forest Garden. Over the last 30 years he has developed just one acre to be intensively productive of fruit and vegetables. And what is significant is that he has achieved it on what supposedly had no agricultural value as it was once sand-dunes. Over the 30 years the plants have created rich soil on an area that had previously only provided very sparse grazing. Towans Forest Garden is an ongoing project to restore a plot of land described as “land with extremely severe limitations that cannot be rectified” in the official soil survey of 1979. Started in 1982, the project follows the principle of Permaculture, and uses the techniques of Agroforestry to intensify the production of food on the land. 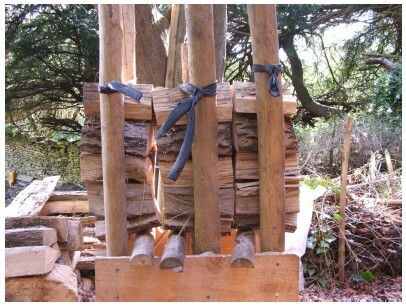 I would recommend people read Raymond’s website – www.towansforestgarden.co.uk. It is a treatise on his commitment to Permaculture, and an inspiration. Raymond is 80 now and told us that 80% of his food comes from his food forest. And what a lively man! He spoke of his alarm at seeing so many neighbours of both his age and younger, being ill with various conditions, and put his good health down to variety and veganism. To draw a picture, the site is crammed with plant-life, with just a narrow path weaving through it. It has a feel of a forest rather than a garden, the dense planting being crucial. Using the ‘chop and drop’ method he has simply let nature make a good soil. Chickens once roamed the site and kept the green-houses healthy, but now there is only one, and they won’t be replaced. Many of the species he has planted are recommended, researched and available from the Agroforestry Research Trust (www.agroforestry.co.uk) which he has worked with over the years. I was also so impressed with the number of moths and butterflies present the day we were there. I hadn’t seen so many since growing up in the 50s. Even the dividing privet hedge to the neighbour’s property had several functions (but I can’t remember if one of them was edible, sadly), although he did talk for sometime on the benefits of the privet species, and we were there when it was in flower and so fragrant. Raymond is a man who notices so much, and at the end of our visit I asked him how he sees himself, as a gardener or a farmer. His reply was decisive – a Natural Farmer. Removing some of the pain from preparing firewood for your stove. choice is to use wood as I have space outside to both store and process quite a lot, which I have done over the 6 years I’ve lived here. But, my age and arthritic-i-ness have forced me to review my firewood cutting and splitting methods to reduce aches and pains. So, here is my process and methods I’d like to share with all those who have aching backs. 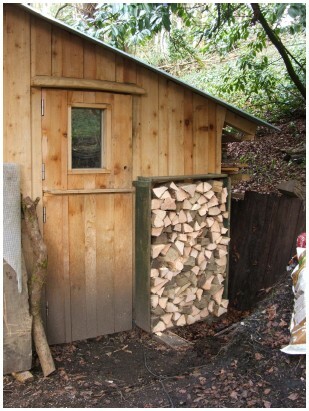 term for a split length of log), and stack them to dry through the summer months. 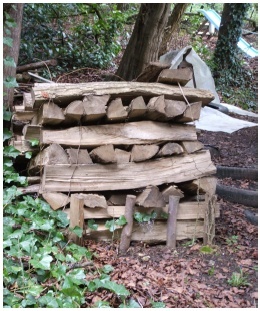 The picture below shows the last of the stack for the winter of 2012/2013. At roughly weekly intervals through the winter I spend an hour or two to prepare at least a week and a half supply, and the clamp in the picture below has been my aid. This prevents me having to do the whole job in one exhausting go, at the beginning of the year, and allows me to regularly enjoy the satisfaction of that out-in-the-woods feeling. the billet clamp as close to the stack as possible and for the most part was able to slide billets into it, reducing lifting. That and the chainsaw cutting could be done within waist to shoulder heights. each side at the suitable height for me not to have to do any bending. The distance between front to back relates to the length of chain blade on my small chainsaw, allowing me to slice right through the billets in one go without the chain end catching. one end only allowing movement of the poles to clamp the billets tightly, and as clear of the chain cut point as possible so as not to damage the saw chain. 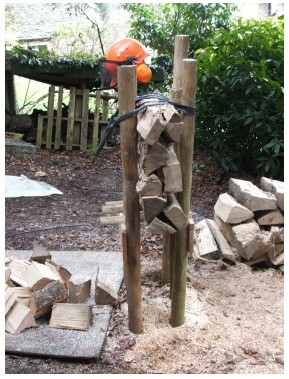 The paired posts are pulled tight using three bicycle inner tubes. need for your fire, and mine takes 6-7 inches, too small for suppliers to like making. So, you need to set the poles according to the size you require. Slice through the outer sections of billets first and then slice between the posts. 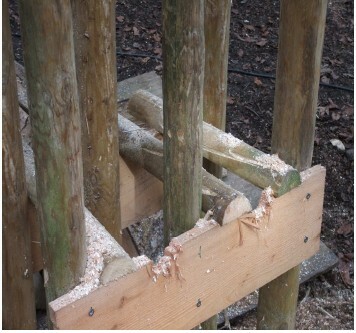 The clamp effect, for the most part, holds the firewood pieces firm, but also allows enough play for the chain not to catch on the loose pieces. For some reason of physics the pieces move away from each other rather than towards each other, and prevents clamping on the chainsaw blade. 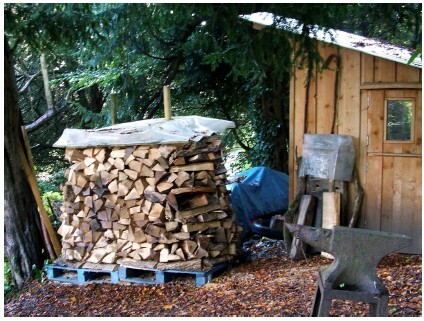 year, I have found, and the smaller the section of the billet the greater the physical economy achieved by the reduction in splitting the firewood lumps as well – if you have a small fire like mine. firelighters. Wood shavings and dried bark work just as well. falling straight into my wheelbarrow to reduce the need for bending my back, even more so. 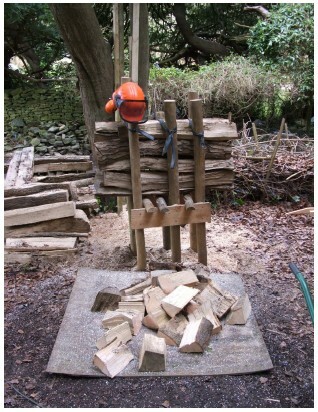 It will be a smaller clamp as Elcombe Firewood supplied me with shorter length billets this year. system). Recycled plastic sheet topping rather than thatching, I’m afraid, qualifying as sustainability rather than traditionalism, and that’s good enough for me. the disease issue will be a hiccup rather than a long-term extinction. I’m hoping so anyway. I wish you happy firewood chopping. There is plenty to follow-up with regards to the historic protest in Stroud involving the occupation of a large Bramley apple tree (Malus domestica) and trying simultaneously to save a significant badger sett on the same grounds. The occupation of the tree involved principally two or three people with several supporters and perhaps up to one hundred visitors during the six days when it was happening. A visitors’ book included messages of support, drawings and two lovely poems. 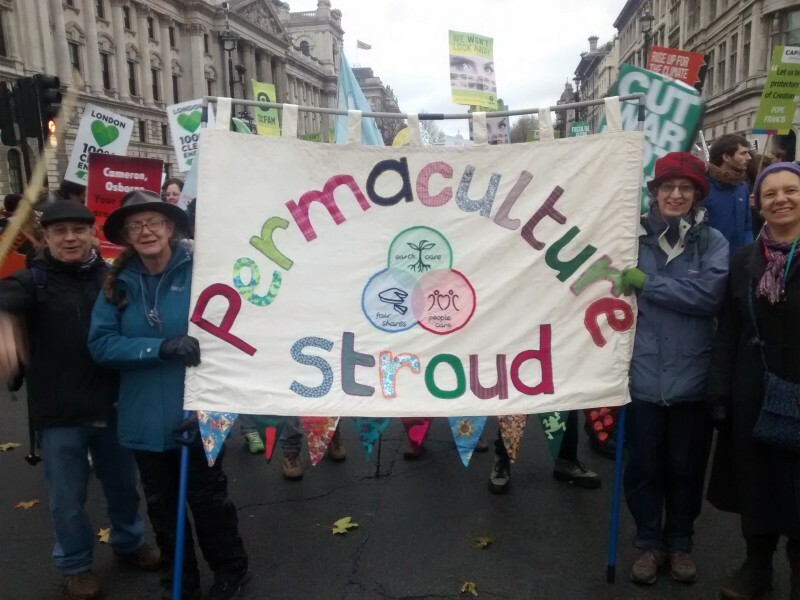 It was therefore significant and to some degree placed Stroud’s credentials as part of the ‘environmental movement’ more squarely upfront once again. This, we should be proud of. There were reports in the Daily Mail, on BBC Points West, ITV West, Stroud TV, and Stroud FM, and in the Stroud News and Journal, Stroud Life and Citizen local newspapers. By the time that you are reading this, the immediate impact of the event may just be fading a little. However, the week also included some heated debate in the Transition Stroud online ‘Discuss Forum’, as well as a wide range of discussions on Facebook and Twitter. 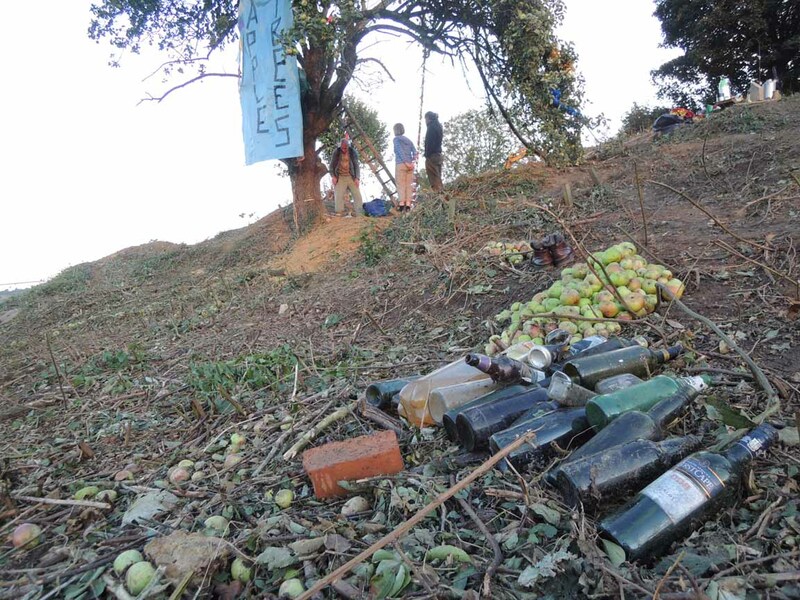 Nearly 400 comments were left on the Mail online site, and amongst these were, to some people’s surprise, many well-thought out messages of support and solidarity for the protest to save the tree. The ‘direct action’ of the protest took place for several reasons and analysis can show how such explicit dissent and resistance in the face of developers, contract workers, some neighbours and the police became necessary. This was about protecting a special tree. The trees were planted as part of an orchard area between seventy-five and one hundred and fifty years ago. This was about protecting an irreplaceable badger sett. A sett with 22 entrances that has been developed over decades. This was about saying “no” to relentless and inappropriate housing development on green spaces within urban settings. This was an old market garden for the town, and-following rejection of a proposed requirement by Stroud District Council-the development will involve no social or affordable housing. This was a protest involving the coming together of individuals. The desire to succeed grew but this particular battle became increasingly arduous over the six days, especially as the police presence increased and the contractors began to strategically organize themselves to pounce on a small number of peaceful protesters. Gerard Walsh, the developer, agreed on television to speak with the protesters. However, he arrived at short notice when only two were present, refused to genuinely engage, and instructed his contractors to undertake unacceptable actions. We were involved on the day when contractors organised themselves to physically overcome the protestors, the police arrested three people and at the same time the tree was cut down to a stump (two of the protestors were ‘de-arrested’ immediately after the felling, one was held overnight in Gloucester and has been charged). The lead-up to this moment involved the use of power strimmers, gradually surrounding the protestors and surreptitiously running towards them. These moments of heightened tension are difficult to bear and they demonstrate the tenacity and determination of the developers to press ahead with in this case a development based on a planning application that was rejected in the past and which neighbours campaigned to stop for nearly three years, with more than 100 letters of objection received by the Council. The weighing and estimations are still taking place but already cider is being made from the apples left strewn all over the ground once the main branches were sawn off in the middle of the night with a bow-saw! Furthermore, Down To Earth have collected several kilograms to make into dried apple rings. We are planning on setting up a cheerful competition to name the apple rings, especially after the messages of support from as far away as India and Australia. 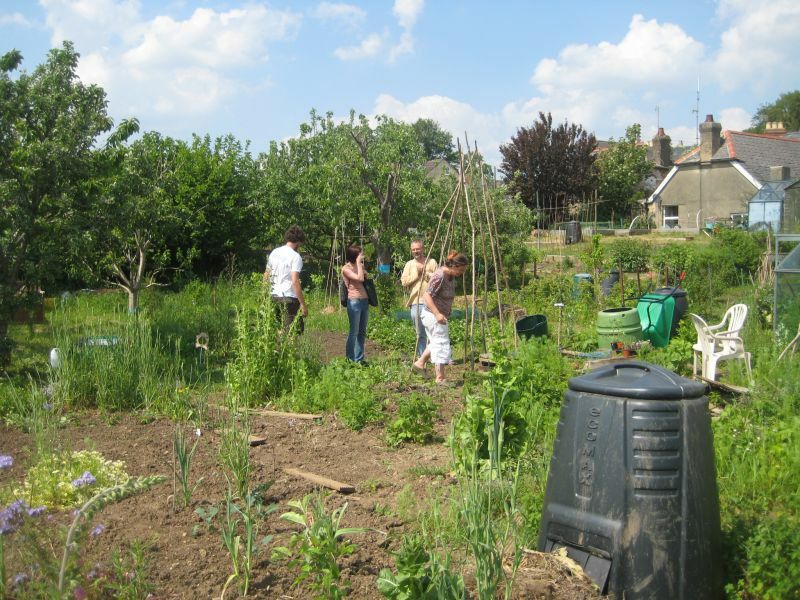 As with last year I am hoping to organise a few work-ins at the Community Allotments allocated for SPG in Cainscross. Around twelve or so people came along last year and we got underway a number of efforts. The main advantage is that we can experiment with permaculture at a very small scale. It also helps those that may not have an allotment just yet. They can try their hand at growing things. There is a greenhouse to help starting off plants. There is an open and flexible plan for the plot but ultimately it’s there for us to share, accepting that people may live further afield and that some people are too busy with other projects. Do pop over some time nevertheless. I suggest the first work-in afternoon for next Sunday the 3rd of February, 12-midday until 3pm. Today looks perfect weather-wise but cross fingers that next weekend is reasonable. If it’s frozen or too wet then please assume that the work-in is cancelled. 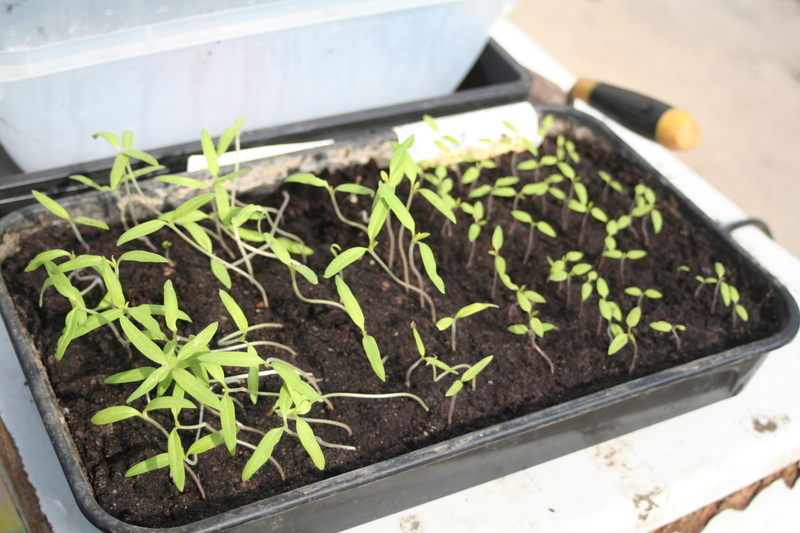 These seedlings have now become large tomato plants. Thanks to all who came along on Sunday. We had leek, onion and garlic soup. The greenhouse has been transformed into a workable and productive setting. Plots and projects are emerging. It’s all exciting. The strawberries are ready to eat. Pop along and help yourself. We talked about the up-and-coming Permaculture course planned for Sept. We also talked about Human Ecology and several other topics.